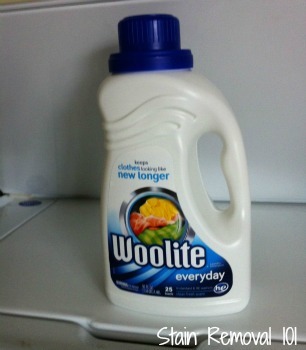 I have now washed several loads of clothing with Woolite Everyday detergent, and was overall happy with its performance. As a bit of background at one point the Woolite brand was known only for washing of delicate fabrics, but since then it has expanded the product offerings it has to include soaps for all types of clothing, not just delicates. At first it called this detergent, which was designed to care for all types of fabrics "Woolite Complete." (You can read Woolite Complete reviews here.) Now, however, the company has changed the name from "Complete" to Woolite Everyday. Also, I ran out of delicate wash and needed to buy some more. Normally I would purchase Woolite delicate wash, or its generic equivalent, but both Kroger (Payless) and Walmart (my two normal stores for shopping) have stopped carrying it. That is when I noticed in its place was the Everyday product, and since it is supposed to clean even delicate fabrics such as wool and silk I though I would give it a try. clothes clean and didn't seem to be too harsh on them. I only used it on delicates though that were lightly soiled, and did not try it on regular clothing since I doubted it would work well on heavily stained or soiled items such as my kids everyday clothes. I might be wrong about this assumption about stain removal power for this product, but since it also has a scent I did not want to use it more than needed. Instead, I used it sparingly only on the items I had to use it on, since I try to only use hypoallergenic laundry detergent whenever possible. That is one complaint I have of the product -- there is not a scent free version. I would love to hear from anyone else who has used this product, sharing your opinions and experiences with it. You can share your review here of this or any other version of this detergent, as well as read other reviews that have already been submitted. In addition, I've create a list of available delicate wash products which you might find helpful if you're looking to find a new cold water wash for fine washables, and would like to see lots of reviews in one place. Hi Taylor! Thanks so much for your review! Glad to see someone is as crazy about getting their laundry "just right" like I am! My main need is to wash my business casual shirts and pants. I go to Thailand every few years and I want to keep the wonderful clothes I get there looking great and lasting... I never know when I'll make the long trip back! I have been using Woolite Delicates just as overkill to preserve the clothes, but I think I'll give Woolite Everyday a try. One note: at Target.com it's called Woolite Gentle Cycle, and the footnote says "new name for Woolite Everyday". Thanks again!